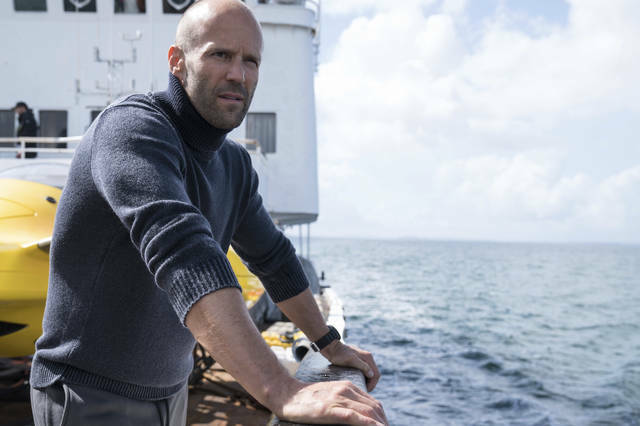 FILE - This file image released by Warner Bros. Entertainment shows Jason Statham in a scene from the film, “The Meg.” The shark thriller “The Meg” became the latest success in Hollywood’s sizzling summer, opening well above expectations with $44.5 million in ticket sales, according to box office estimates Sunday. NEW YORK (AP) — Adding to Hollywood’s sizzling summer, the shark thriller “The Meg” opened well above expectations with an estimated $44.5 million in ticket sales, while Spike Lee had his best debut in a decade. Lee’s critically acclaimed “BlacKkKlansman” also opened strongly with $10.8 million in 1,512 theaters. The Focus Features release, which took the Grand Prix at the Cannes Film Festival in May, was timed to the anniversary of the violent clashes between white nationalists and anti-racism counter protesters in Charlottesville, Virginia. Lee’s film, produced by Jordan Peele (“Get Out”), is a true-life tale of African-American police detective Ron Stallworth (played by John David Washington, son of Denzel), who in 1979 infiltrated a Colorado Springs, Colorado, cell of the Ku Klux Klan. 1. “The Meg,” $44.5 million ($96.8 million international). 2. “Mission: Impossible — Fallout,” $20 million. 3. “Christopher Robin,” $12.4 million. 4. “Slender Man,” $11.3 million. 6. “The Spy Who Dumped Me,” $6.6 million. 7. “Mamma Mia! Here We Go Again,” $5.8 million. 8. “The Equalizer 2,” $5.5 million. 9. “Hotel Transylvania 3,” $5.1 million. 10. “Ant-Man and the Wasp,” $4 million.